Johnny Depp (l.) and Armie Hammer in "The Lone Ranger"
It's a mantra that Hollywood studios have taken to heart in recent years. Check out the movies dominating the July 4 holiday box office: "The Lone Ranger," "Despicable Me 2," "Monsters University" and "Man of Steel." If those titles don't provoke a sense of deja vu, how about "Star Trek Into Darkness," "Fast and Furious 6," "The Great Gatsby" and "Iron Man 3." At Disney's premiere of "The Lone Ranger" in California, Johnny Depp talks about why he often plays characters that require heavy make-up. Also, he discusses his Rolling Stone comments about retirement. All are sequels, prequels, reboots or reinventions. And with May and June delivering record-setting numbers at the domestic box office thanks largely to "Iron Man 3," "Man of Steel" and "Monsters University," it's a trend not likely to end anytime soon. "The good old days - the late 1960s, '70s and '80s - when a studio could take a chance on a movie, those days are few and far between now," says Scott Mantz, resident film critic for Access Hollywood Live. "I wouldn't say they are completely gone, but it is a very rare situation when you find something that is a risky move that hits big. The last thing I can really think of that did that was 'The Matrix' in 1999." According to Mantz, blockbusters have become so expensive to produce and publicize that for studios to minimize their risk, they opt for reboots of known franchises or movies based on popular comic book characters. Yet simply basing a big budget film on an existing character or beloved story is no guarantee of ticket sales. Subject familiarity may help during the pre-release marketing campaign but proof of success ultimately lies in box-office returns. That distance certainly paid off for director Baz Lurhmann's re-imagined "The Great Gatsby" which has grossed over $300 million worldwide since its debut. It's a scenario Disney is no doubt hoping to replicate with their costly remake of "The Lone Ranger." Director Gore Verbinski describes how horrifying it was when Johnny Depp fell off his horse while filming The Lone Ranger." Also, Gore reveals how they found the right mask for Armie Hammer. 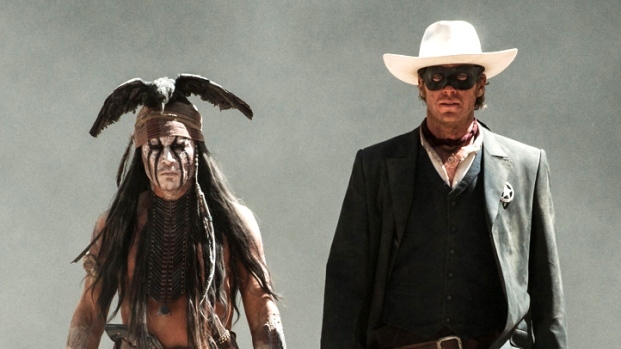 "'The Lone Ranger' is a huge gamble because most people who know the character are older. And older movie goers are not usually the type of people who go out and see a movie on the first weekend," says Mantz. "The challenge for Disney is to make 'The Lone Ranger' cool and fun and family friendly to justify its production budget, which unfortunately for the studio has topped $250 million, and that's not even including the $150 million it's reportedly costing them to market and publicize the film." The Lone Ranger character has been with us for more than 80 years, first arriving via radio in 1933 before riding to success on television in the series that ran from 1949 to 1957. He's graced the silver screen in a trio of films - "The Lone Ranger (1956), "The Lone Ranger and the Lost City of Gold (1958), "The Lone Ranger" (1981) - and returns this summer with Armie Hammer fighting wrongs from behind the mask and Johnny Depp by his side in the role of Tonto. "We knew that it was time for 'The Lone Ranger' and westerns to be reborn," says producer Jerry Bruckheimer in the film's production notes. "Just as [director] Gore [Verbinski] and I knew that it was time for pirate movies to be resurrected when we first developed 'Pirates of the Caribbean' for the screen a decade ago." Bruckheimer does know a thing or two about successful franchises. But only time and audience engagement will reveal whether "The Lone Ranger" can rustle up the kind of returns the "Pirates" franchise has delivered. Collectively, the four "Pirates" films to date have brought in $3.7 billion at the worldwide box office. For Mantz, the origin of this current trend of rebooting or reinventing can be traced back to characters as equally oddball and fond of masks as Tonto and the Lone Ranger. It was following the success of Marvel's "X-Men" in 2000 that Hollywood began returning again and again to the well of franchises and cherished characters. The film relaunched interest in the superhero genre and that interest was sustained through a slew of follow-up X-Men sequels and prequels, the Spider-Man franchise (which received a second reboot with last year's "The Amazing Spider-Man") and the Dark Knight trilogy of Batman movies, before culminating in "The Avengers'" 2012 record-breaking haul. "Last summer when 'The Avengers' made over $1.5 billion worldwide it basically sealed the superhero genre in stone for years and years to come," continues Mantz. "This year 'Iron Man 3' has made $1.2 billion worldwide - another reason the studios want to keep making superhero movies because they are doing well and that there is a built in awareness." And with "The Amazing Spider-Man 2" soaring onto screens in 2014 along with the return of "Captain America," "Transformers 4," "Fast & Furious 7," "Expendables 3," "Night at the Museum 3" and another outing for James Bond, plus "Avengers 2" and a raft of new "Star Wars" and "Terminator" flicks being rolled out annually beginning in 2015, audiences can expect a steady diet of reinvention well into the next decade.